It stated that competent authorities have given permissions, subject to various conditions like steps to be taken up for protecting the wildlife and compensatory afforestation activities, for widening/improving NH 4A in Belagavi region by diversion of 84.85 hectares of forest land for this purpose. However, the NHAI clarified to the court that it has decided to return around 6.423 hectares (out of 84.85) of forest land within Dandeli Wildlife Sanctuary while designing the improvements of highway on this stretch of 13.32 km by maintaining the existing 12 m right of way. 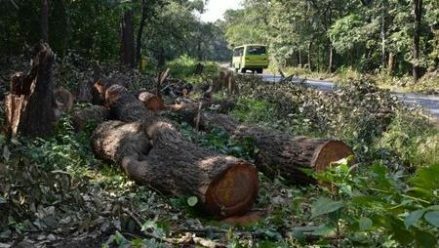 The NHAI has denied the allegation that the entire stretch of NH 4A in Belagavi region is being widened in the range of 29 to 45 m of right of way affecting large extent of reserved forests. It also stated that it has taken up measures, as recommended by the competent authorities to protect wildlife, to construct underpasses/flyovers for easy movement of elephants, tigers and other animals. The decision to ban movement of vehicles, other than vehicles of emergency services, between 9 p.m. and 6 a.m. here was taken in December 2018. When the counsel for the petitioner alleged that several trees on NH 4A passing through the sanctuary area were already cut, the bench adjourned further hearing asking the counsel to file an affidavit in this regard.